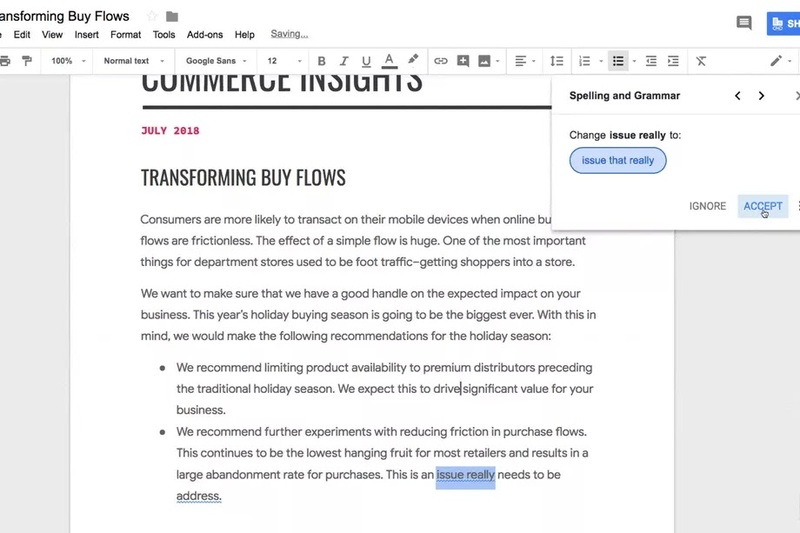 For the ones with a slightly lenient grip on grammar and language, fear no more, Google has stepped up its game and now provides a grammar checker inbuilt for Google documents. You don’t need to question every creative sentence that forms in your head, whether it actually makes sense or have you completely lost all control over the language basics while forming an artistic sentence that’s more towards the abstract side of art with little to understand. This feature will rectify the mixed up words (like "affect" and "effect"), inappropriate tenses, improper use of clauses and commas, among other things. Google says that the mode of correction will be a mechanic like the one used for Google translation in multiple languages. It will be correcting the sentences instead of translating them. The details of this update are still quite limited, how exactly the corrections will take place, there is no clear explanation yet. What can be said with uncertainty, however, is that Google will most probably deliver as it promised. The way its translation machine has become better in just two years of time, and now according to the company, reaching the levels of human accuracy. Incorporation of an Al component in a grammar checker has already been used by a browser and keyboard extension Grammarly though. So we can’t say that it’s an original idea. This feature will not be released commercially just yet. it's launching for business users initially, and the company’s administrators will have to enable it to be tested by the users. Google hasn’t specified a time frame when this feature will be available for the consumer accounts and which languages will it support/correct. Also, along with the grammar check feature, the Smart Compose feature will also be enabled by Google for business consumers inside of Gmail. This feature literally completes your unfinished sentences based on the context of your email, was launched to the general public in May for further testing. Will this be as helpful as the Google translation has been, is yet to be found out? One thing is for sure is that this feature will definitely make your experience with the Google documents easier.